The chairman of the Israel Consumer Council board, Dr. Miriam (Miki) Haran, and Council CEO, Adv. Ehud Peleg, have submitted to the Economy Minister, Naftali Bennett, the 2013 report on “Civil Enforcement – The Assistance Program for Consumers in Drawing Up Small Claims.” The Civil Enforcement program, which assists consumers in drawing up claims to be filed with the Small Claims Courts, is offered for free by the Israel Consumer Council to consumers for whom the normal negotiations with businesses have not led to a solution of the wrongs done to them. In 2013, a sum of over one million shekels was returned to consumers who were assisted by this Consumer Council service (1,002,850 NIS, as at the date of the report’s preparation), an average of 4,011 NIS per consumer. The Council assisted in drawing up about 600 claims for the Small Claims Courts, with 94% of the claims drawn up by the Consumer Council being resolved in favor of the consumers (either by a court judgment, or through an arrangement acceptable to the consumer, but without a formal judgment). The majority of the small claims filed through the Consumer Council dealt with products for the home (furniture, etc. ), with 247 claims, or 41% of the claims filed. 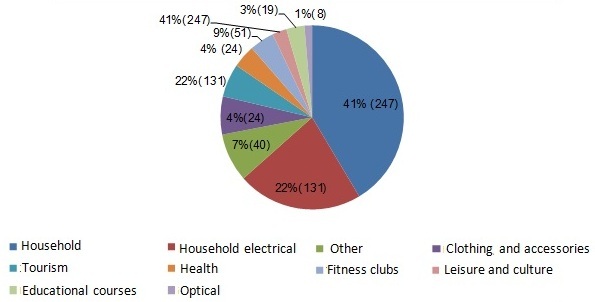 131 claims were filed in connection with household electrical items, 22% of the total (a chart summarizing the data is shown below). The project is run with the support and funding of the Ministry of Economy, and its implementation by the Israel Consumer Council commenced in 2012. The claims are drawn up by law students, recruited by the Council for this purpose. The students receive professional training in handling consumer complaints, and legal training in the broad area of consumer protection law, and in drawing up statements of claim for the Small Claims Courts. Economy Minister, Naftali Bennett: “I believe that consumers who are aware of their rights will be able to help bring down the cost of living. We are against conduct by businesses that harms the consumer. The ‘Civil Enforcement’ program plays an important role in bringing down the cost of living – if businesses understand that they can’t get away with everything, they won’t try.